In life, a lot can change in five years. Children can graduate from college, car loans can be paid off, and babies can grow into toddlers. For ag retailers, the past five years have also seen their share of changes. Primarily, however, commodity prices have remained stubbornly low, net farmer income has dropped, and once-regular agricultural export demand from countries such as China has been brought into question. Five years ago, in 2015, CropLife® magazine started a feature to kick off its annual State of the Industry report — the Buying Intention Survey. At that time the agricultural industry was coming off of several up-and-down economic years, and most market watchers were completely at a loss to make accurate predictions regarding what product categories ag retailers and their grower-customers would be supporting with their dollars for the upcoming growing season. The inaugural survey helped provide some clarity in this regard. Now, five years later, the CropLife Buying Intention Survey seeks to continue this tradition. So without further delay, here are the findings from this year’s survey, with some looks back at data from the 2015 and 2018 surveys. For the 2019 Buying Intention Survey, CropLife sent out an email survey during a two-week period in mid-November. In all, 103 respondents sent in their survey forms. Looking more closely at exactly who was filling out the surveys, 90% described themselves as ag retailers/dealers. The remaining 10% was split fairly evenly among four other categories: Fertilizer producers (4%), equipment dealers (3%), chemical manufacturers (2%), and researchers/university representatives (1%). So when all was said and done — and tabulated — what was the overall spending picture for crop inputs and equipment in 2019? As always, some segments will perform better than others, some worse, and the majority will be nearly identical in their market outlook from the year before. During the first CropLife Buying Intention Survey, the fertilizer category was coming off several very strong sales years. In fact, from the start of the 2010s until 2014, fertilizer sales for ag retailers represented almost half (49%) of all crop inputs/services being sold in a given year. Then the bottom dropped out for the category. Indeed, according to data from the 2015 CropLife Buying Intention Survey, 38% of respondents were planning to spend less on dry fertilizer than they did the year before. The same went for liquid fertilizer, where 26% of respondents were looking to decrease their spending in this area. Fast-forward to 2018, and the situation was largely the same as in 2015. According to the 2019 CropLife Buying Intention Survey, only 23% of respondents spent more than $10 million on their dry fertilizer purchases during the year. Liquid fertilizer purchases over $10 million totaled 20% for respondents. This situation was even more pronounced for the smaller fertilizer segments of micronutrients, specialty fertilizers, nitrogen/phosphorus stabilizers, and additives/enhancers. Here, the spending increases from 2018 vs. 2017 tended to range in the less than $100,000 area, from 51% for additives/enhancers to 31% for micronutrients. 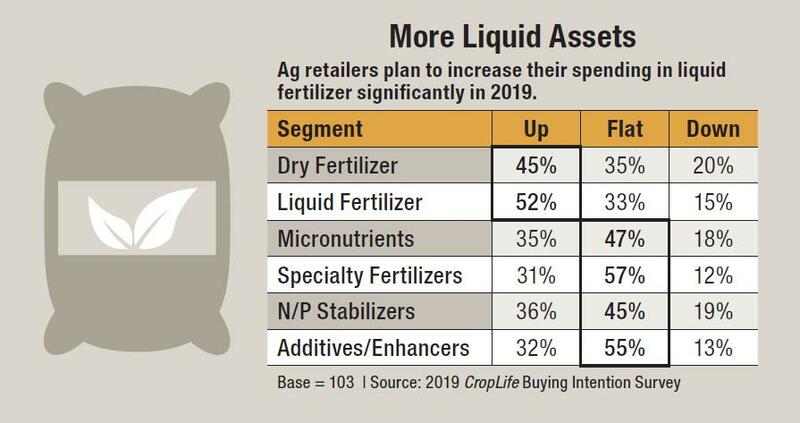 For 2019, the outlook for fertilizer seems equally weighted, with the larger segments enjoying spending increases at the expense of the smaller ones. When asked if they were planning to increase their spending on dry fertilizer 1% to more than 11% for the upcoming growing season, 45% of respondents said this was the case. This represented a 1% increase from the 2018 CropLife Buying Intention Survey. This spending gain looks to be even stronger for liquid fertilizer. In 2018 41% of respondents were increasing their spending 1% to more than 11% in this segment. This year that percentage jumped significantly to 52%. For the smaller segments, this news isn’t nearly as positive. When it comes to seeing their spending on these segments increase 1% to more than 11% during 2019, virtually all of the respondents have percentages in the 30% range. The highest percentage will occur in the nitrogen/phosphorus stabilizers segment at 36%. Specialty fertilizer spending increases will be the lowest at 31%. 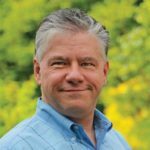 During the last few years the crop protection category has been one of the annual growth engines for the ag retail marketplace. Over this time, the category has regularly topped its yearly sales from one year to the next and increased overall market share among crop inputs/services to just short of 40%. Of course, for those readers who have paid attention to the annual CropLife Buying Intention Survey over the years, this shouldn’t come as a surprise. In our magazine’s first Buying Intention Survey in 2015, all three sub-segments of the crop protection category — herbicides, fungicides, and insecticides — were relatively subdued in projected dollar increases. In fact, according to the 2015 CropLife Buying Intention Survey, 48% of respondents were planning to increase their spending between 1% and more than 11% in the herbicides segment. Fungicides and insecticides, however, were projected to see increased spending from only 28% and 27% of respondents, respectively. But things had improved considerably by the time the 2018 CropLife Buying Intention Survey was conducted. In this survey, 60% of ag retailers expected to increase their spending on herbicides between 1% and more than 11% for the 2018 growing season. Likewise, 47% of respondents planned to up their spending on fungicides by this amount, and 36% planned to do the same with insecticides. Sporting such healthy numbers these past few years, can the crop protection category continue to grow by these kind of percentages? Based upon the numbers, it doesn’t appear so. Still, the dropoff won’t be that extreme for two of the three segments. According to the 2019 CropLife Buying Intention Survey, 52% of respondents plan to increase their spending on herbicides between 1% and more than 11% during the year. Thirty-seven percent plan to keep their herbicide spending at the 2018 levels, with the remaining 11% decreasing spending between 1% and more than 11%. As for fungicides, the percentage of ag retailers planning to increase their spending between 1% and more than 11% remains flat at 47%. Insecticides, meanwhile, will see a slight downtick in the percentage of respondents increasing spending between 1% and more than 11%, from 36% in 2018 to 35% this year. 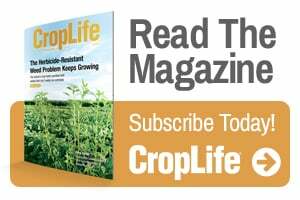 Regarding two smaller segments within the crop protection category — seed treatment and adjuvants — the news is less rosy than it was one year ago. During the 2018 growing season, both of these segments saw their spending increase between 1% and more than 11% among ag retailers in the 40% range. 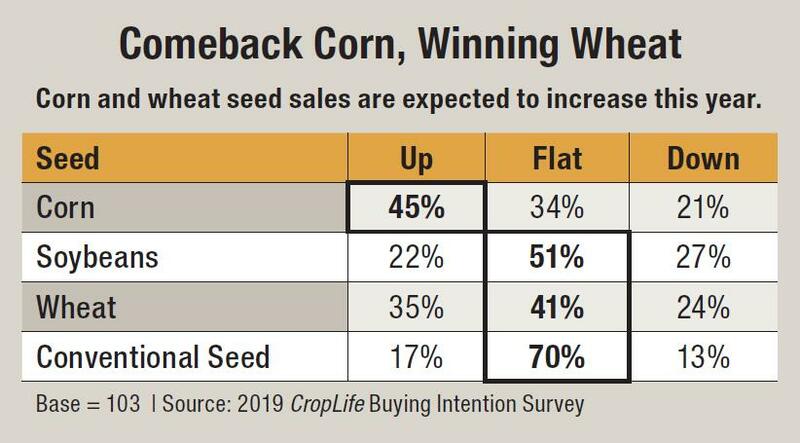 But according to the numbers from the 2019 CropLife Buying Intention Survey, both segments are looking for spending increases during this upcoming growing season of only 33%. More than half of respondents in each segment (53% in seed treatment and 58% in adjuvants) plan to keep their spending levels the same as they were in 2018. Better news appears to be coming for the two newest segments within the crop protection category — biologicals and biostimulants. In both these segments, according to survey results, ag retailers are planning to increase their spending levels between 1% and more than 11% during 2019. For biologicals, the increase is small — 1%, from 28% in 2018 to 29% this year. For biostimulants, the gain is slightly larger — from 23% in 2018 to 29% in 2019, an uptick of 6%. Looking at the seed category, it probably didn’t surprise many CropLife readers when soybean acreage across the U.S. grew so substantially during the 2018 growing season vs. other row crops. This was because in the 2018 CropLife Buying Intention Survey, 55% of respondents indicated they planned to increase their spending on soybean seeds between 1% and more than 11%. Corn seed spending finished a distant second in the 2018 survey, with 49% of respondents looking to spend more in this segment. But in 2019, it looks as if corn will make a comeback of sorts. In the 2019 CropLife Buying Intention Survey, 45% of ag retailers are looking to increase their spending on corn seed between 1% and more than 11% for the upcoming growing season. Another 34% will spend the same amount on corn seed as they did during 2018. As for soybeans, only 22% of survey respondents plan to increase their spending on these seeds between 1% and more than 11% during 2019. The vast majority, 51%, plan to hold their soybean seed spending in 2019 at the same level it was at during 2018. The remaining 27% plan to decrease spending in this segment. Significantly, as soybean seed spending drops back, wheat seeds seem poised to make some gains. According to the 2018 CropLife Buying Intention Survey, only 27% of respondents planned to boost their wheat seed spending between 1% and more than 11% during the year. In the 2019 survey, this percentage jumped to 35%. In the equipment sector, plans to increase spending any percentage year-over-year have seemed less common. 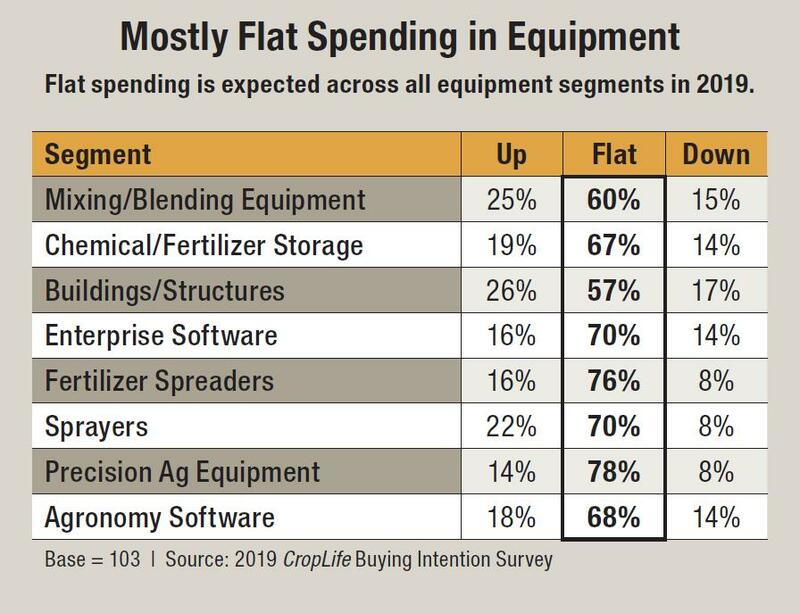 In fact, according to the 2018 CropLife Buying Intention Survey, the percentage of ag retailers looking to increase their spending in equipment between 1% and more than 11% for the year ranged from a high of 39% for precision ag equipment to a low of 25% for mixing/blending equipment. Going into 2019, it appears that none of the eight segments in this category will have spending increases in the 30% range. Instead, the middle teens seems to be what can be expected. Among the eight segments, three are projected to have spending increases between 1% and more than 11% in the 20% range. This includes self-propelled sprayers (22%), mixing/blending equipment (25%), and buildings/structures (26%). Two other segments — chemical/fertilizer storage and agronomy software — will have percentages in the high teens (19% and 18%, respectively). In the mid-teen percentage range will be two other segments — enterprise software and fertilizer spreaders. Both of these are expected to see spending increases between 1% and more than 11% among 16% of respondents. And what of last year’s market leader in spending growth, precision ag equipment? According to the 2019 CropLife Buying Intention Survey, only 14% of respondents expect to increase their spending in this segment between 1% and more than 11% this year. The vast majority, 78%, expect to keep their precision ag equipment spending levels identical to the ones they had during the 2018 growing season. The remaining 8% plan to decrease spending in this segment between 1% and more than 11% during the year. I agree with your reasoning but wish you also pointed out that the same resistance pattern is also for fungicides via over use and not rotation of fungicides to control diseases.